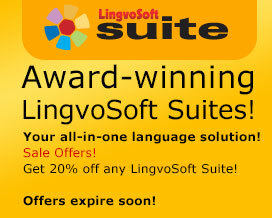 The LingvoSoft Suite English <-> Chinese Contonese Traditional for Windows is a dynamic language learning and translation solution for your desktop or laptop PC. This remarkable utility answers all the needs of almost any user of foreign languages. Businesspeople, travelers, students, and professional translators will all benefit from its wide range of unique features. Fully-integrated and compatible with the most popular MS Office applications (Word, Internet Explorer and Excel), it extends the functionality of your existing word processing and internet tools with the added benefit of instant translation. The LingvoSoft Suite English <-> Chinese Mandarine Traditional for Windows is a dynamic language learning and translation solution for your desktop or laptop PC. This remarkable utility answers all the needs of almost any user of foreign languages. Businesspeople, travelers, students, and professional translators will all benefit from its wide range of unique features. Fully-integrated and compatible with the most popular MS Office applications (Word, Internet Explorer and Excel), it extends the functionality of your existing word processing and internet tools with the added benefit of instant translation. LingvoSoft Suite English <-> Chinese Cantonese Traditional for Windows Mobile is a universal language management and translation solution for devices running Windows Mobile. This fully integrated collection of the most popular and efficient LingvoSoft titles answers the needs of anyone who uses foreign languages for business, travel or study. The perfect all-in-one travel solution, LingvoSoft Travel Suite English <-> Chinese Cantonese Traditional for Windows Mobile provides everything needed to make business travel more successful and leisure travel more enjoyable. A unique combination of speech-enabled translating dictionary , a talking travel phrasebook , this resource for Windows Mobile delivers practical information you can count on when visiting another country. The perfect all-in-one travel solution, LingvoSoft Travel Suite English <-> Chinese Mandarin Traditional for Windows Mobile provides everything needed to make business travel more successful and leisure travel more enjoyable. A unique combination of speech-enabled translating dictionary , a talking travel phrasebook , this resource for Windows Mobile delivers practical information you can count on when visiting another country. The Learning Voice PhraseBook English <-> Chinese Mandarin Traditional for Windows is part of a unique suite of language learning applications for your PC. It provides nearly 14,000 travel-oriented phrases and instantly translates in either direction between English and Chinese Mandarin Traditional. But what makes this PhraseBook truly remarkable is that its contents can be spoken aloud in both languages using natural human voicing as recorded by native speakers.